overlooked in the rush for the next shiny new technologies. 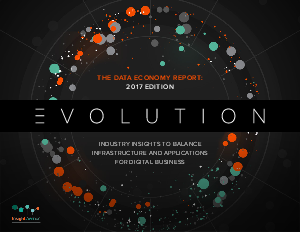 EVOLUTION 2017 Data Economy Report is a large, global study measuring the digital state of today’s businesses and how well they are putting their data to work to drive innovation. The report also acts as a 2017 benchmark for organizations accelerating into the “Cloud Era” and gauging where they are in balancing infrastructure and applications in their business and how this is set to evolve as we approach 2020. Cloud – migrations and mistakes? Data: taking back control in uncertain times.